If you have a loved one with pet guinea pigs, you know they’re passionate about their little piggies. These adorable pets have a way of squeezing their way into every corner of your life. That’s why guinea pig gifts make a great present for those pet owners. Sometimes it’s tricky to find unique or thoughtful gifts for guinea pig lovers. Luckily there are plenty of fun and cute presents you can buy for your loved one to help celebrate their favorite pet. This is a cute and fun gift for guinea pig owners. 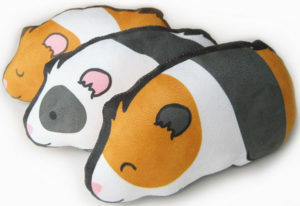 These guinea pig plush pillows are handmade, the design is professionally printed on faux suede and hand sewn stuffed with polyfill. There are two different size options and three different designs. Made to order, this is a unique and fun gift to accent the home of any guinea pig lover. Many guinea pig owners wish they could take their pets with them everywhere. This gift will give them the ability to care a guinea pig in their pocket. 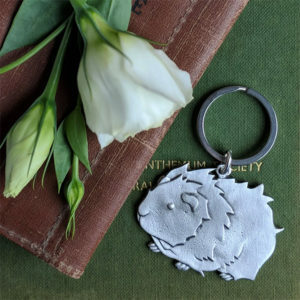 Everything Guinea Pig handmakes these gorgeous pewter keychains that look like fuzzy, fluffy guinea pigs. Their exclusive design is not available in stores and makes a thoughtful gift for guinea pig owners. One of the best parts of being a guinea pig owner is watching your piggies enjoy playtime. When you see them popcorning around the room, you know they’re having a good time. 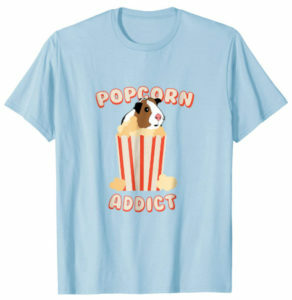 This t-shirt is the perfect gift for guinea pig owners who can’t get enough popcorn! Available in men and women’s sizes in black, slate, baby blue, green, and pink. Also available as a hoodie. This is a funny and cool option if you’re shopping for gifts for guinea pig lovers. 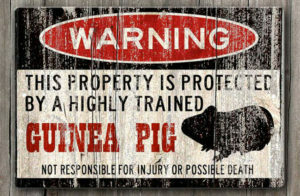 The sign says “WARNING: This property is protected by a highly training Guinea Pig. Not responsible for injury or possible death.” The sign is hand printed on aluminum with a choice of a distressed wood look, aged metal, or a clean brand new design (ready to match any existing decor). This makes a fun sign to hang anywhere in or outside the home. These fun and sassy socks from Socksmith feature cute cartoons of guinea pigs. These socks are comfy, stylish, and machine washable. This is not only a perfect guinea pig gift, it makes a great stocking stuffer! Available in pink and turquoise. This is a gift perfect for young and old guinea pig pet owners. 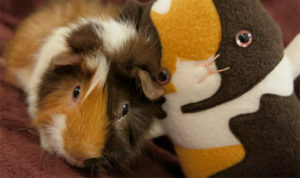 These guinea pig plush toys, known as “cavy clones” are made to be a match to your loved one’s beloved pet piggie. Made from soft fleece and faux fur, they’re as cuddy and cute as a real piggie. We all know that feeling: Saturday night and we’re supposed to go out, but we’d rather stay home with our pets. This is the perfect guinea pig gift for introverts. The t-shirt says “I’d rather be hanging out with my guinea pigs. This funny t will show the world their priorities. 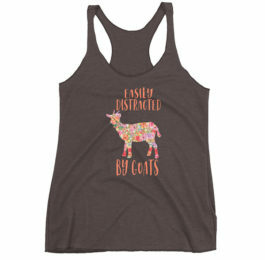 Available in men, women, and youth sizes in the colors black, navy, blue, brown, and purple. Also available as a hoodie. If you’re looking for a unique and handmade piece of jewelry for your cavy loving friend or family member, these earrings would make a great present. 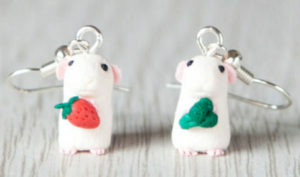 This pair of white guinea pigs is hand crafted from polymer clay, so not two sets are alike. 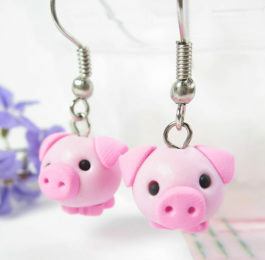 These earrings are adorable and will make any guinea pig owner squee. White not your color? The same artist makes other colors as well. This gift is so cool! Collage Orama specializes in recycling old dictionary pages to turn them into beautiful art prints. This print features a fun illustration of a guinea pig. 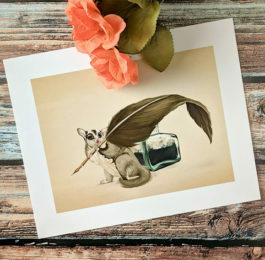 This unique print is perfect to frame and give to any guinea pig lover. What’s the one thing that can make William Shakespeare’s Romeo & Juliet even better? Guinea pigs, of course! This fun picture book features photos of guinea pigs acting out the classic story of star-crossed lovers, including costumes and sets. It’s a great way to introduce children to classic literature and it makes a fun gift for guinea pig loving adults as well. This is the perfect t-shirt for the pet parent who exudes positivity. 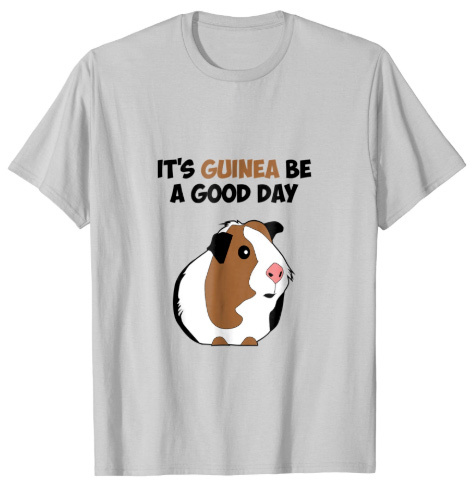 It says “It’s Guinea Be A Good Day” and every day is a good day when you have adorable pet guinea pigs in your life. Available in Men and Women’s sizes in white, baby blue, silver, yellow, and pink. Also available as a hoodie. This is a handmade item you won’t find in any stores. 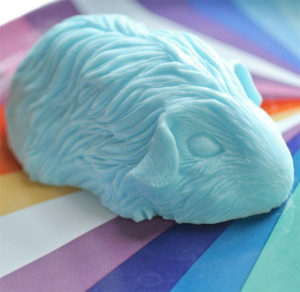 Add a little guinea pig love to the bathroom with these adorable soaps. Made in small batches, the soap is hand molded. It’s made from glycerin and it’s vegan! Custom made when you place your order, these cavy soaps come in 19 different color options. They’re super affordable, which make them a great addition to a gift basket or perfectly sized stocking stuffers. Often when shopping for gifts for guinea pig lovers, you’ll see a lot of cheaply printed mugs with cartoonish cavies on them. These mugs are very different and a perfect gift for coffee and tea drinking pet owners. 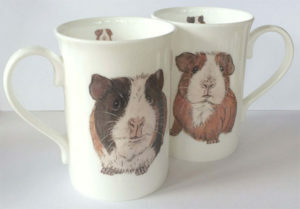 Hand-painted on bone china, these mugs feature detailed and lifelike illustrations of guinea pigs. There two piggies painted on the outside and two inside to surprise you as you drink your coffee. This is an unforgettable gift you can’t find in stores. Popsockets are the must-have accessory for all smartphone users. It’s a convenient grip that makes holding your phone easier and also creates a stand to prop up your phone for easy viewing when watching videos. This Popsockets grip features a bold and bright illustration of a cute guinea pig. It’s a fun way to add a little pigginess to your fun with a useful accessory. The best guinea pig gifts are funny and practical! This is one of those gifts. 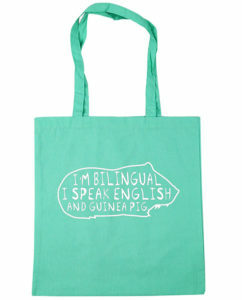 It’s a tote bag that says “I’m bilingual, I speak English and Guinea Pig.” This is perfect for those pet parents who easily communicate with their piggies. Hand printed on black, fuschia, cornflower, mint, or navy fabric. Buy some other small guinea pig gifts to stick inside and great a gift bag for your beloved. Add some cute guinea pigs to your loved one’s kitchen. This adorable guinea pig salt and pepper set is the perfect accessory for any home. Made from porcelain they feature beautifully painted features, with a brown and white piggie salt shaker and a black and white pepper shaker. The price is affordable, and according to the Amazon reviews, the quality is impressive.